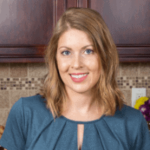 Published: Jan 25, 2018 · Modified: Apr 11, 2019 · By Jen Sobjack · This post may contain affiliate links. Super soft and creamy fudge spiced with cinnamon, nutmeg, and cayenne then coated with white chocolate. 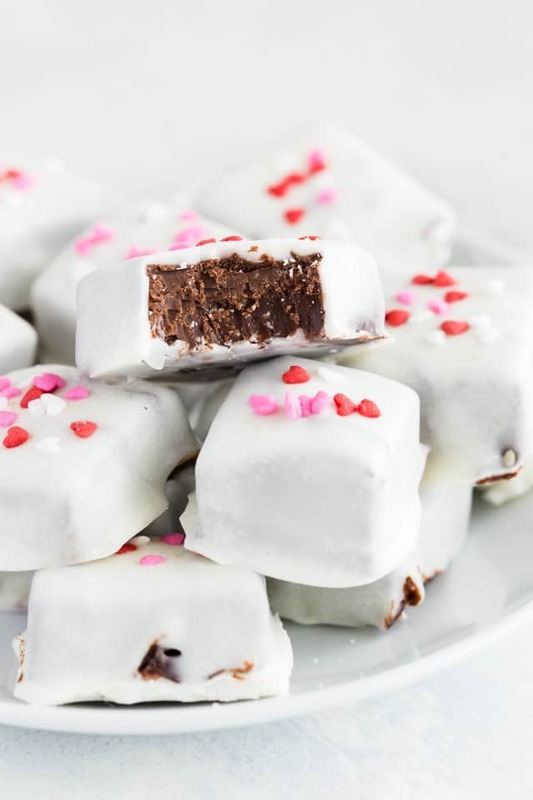 These Mexican Hot Chocolate Fudge Bites are sure to spice up your Valentine! 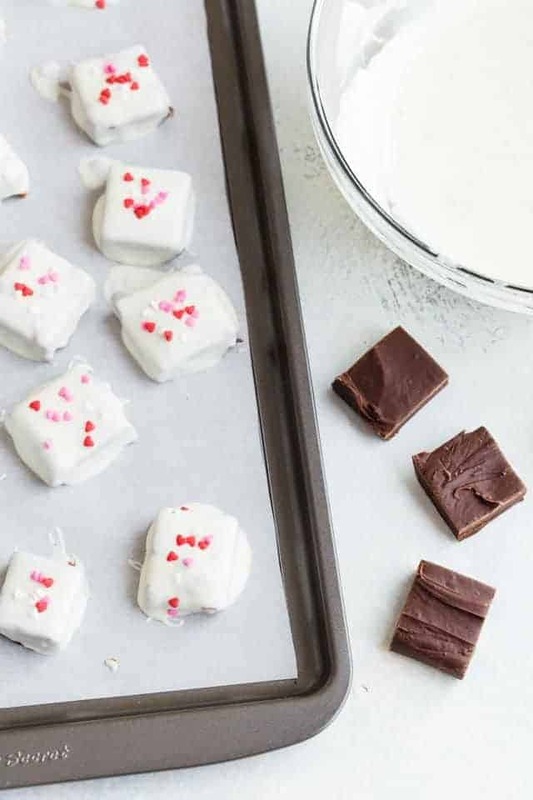 Mexican Hot Chocolate Fudge Bites is actually super simple to make. There are no intricate steps involved and the fudge is made right in the microwave! For this recipe, you need a good quality chocolate. I often reach for Ghiradelli but lately, I’ve been loving Scharffen Berger. The flavor is deep, rich, and so chocolatey. And it melts so smooth. The fudge center is made with bittersweet chocolate. You can use chips, chunks, or baking chocolate. If using baking chocolate, it needs to be coarsely chopped. How to make spicy hot chocolate fudge in the microwave? Melt the chocolate with sweetened condensed milk. I popped mine in the microwave for 1 minute then again in 10-second intervals until the chocolate was melted and the fudge was smooth. Then stir in some cayenne pepper, cinnamon, and a little nutmeg. This is by far the best part of the whole recipe. Because we are using bittersweet chocolate, the fudge isn’t overly sweet. It’s an incredible balance made better with a little heat. Pour the fudge into an 8×8-inch pan lined with parchment paper and smooth it out evenly. The fudge needs to refrigerate for two hours or until it has set. 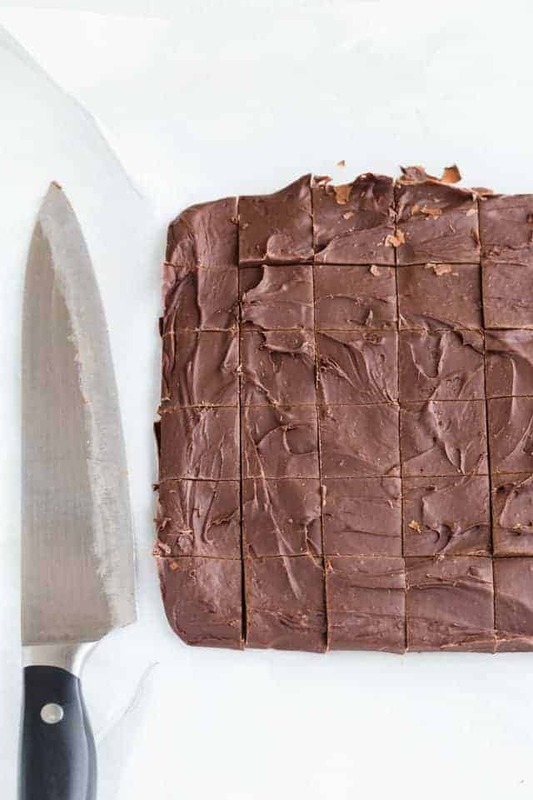 Remove the fudge from the pan and slice it into 1-1/2 to 2inch squares. You can get 25 slices of spicy hot chocolate fudge if you cut them 1-1/2 inches wide. Melt white chocolate chips and dip each piece of fudge until evenly coated. 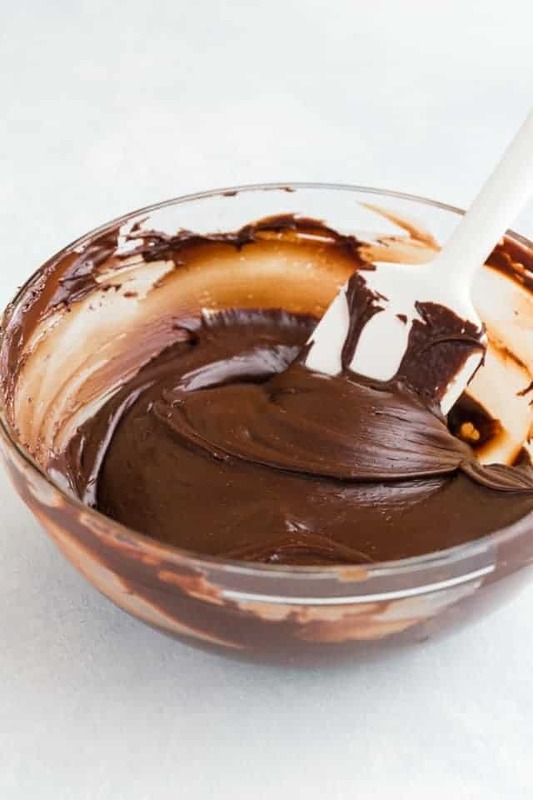 The simplest way to dip the fudge is to use a fork. Set the fudge on the tip of the fork, dip in the melted wafers, and tap the fork on the side of the bowl to remove any excess. How to melt white chocolate chips? Place the white chocolate chips in a heatproof bowl. Fill a small pot with about an inch of water and bring to a simmer. Set the bowl of white chocolate chips over the pot and stir continuously until the chocolate is melted and smooth. This process takes several minutes. Don’t rush it. Keep the heat low and stir non stop. This is the best way to prevent white chocolate from seizing and will yield smooth melty chocolate. To make these Mexican hot chocolate fudge bites extra special for Valentine’s Day I decorated the top with little heart sprinkles. Aren’t they cute? Combine the baking chips and sweetened condensed milk in a microwave-safe bowl. Heat on high for 1 minute. Stir until the chocolate is completely melted. Heat in increments of 10 seconds if additional heating is needed. Stir in the cinnamon, nutmeg, and cayenne. 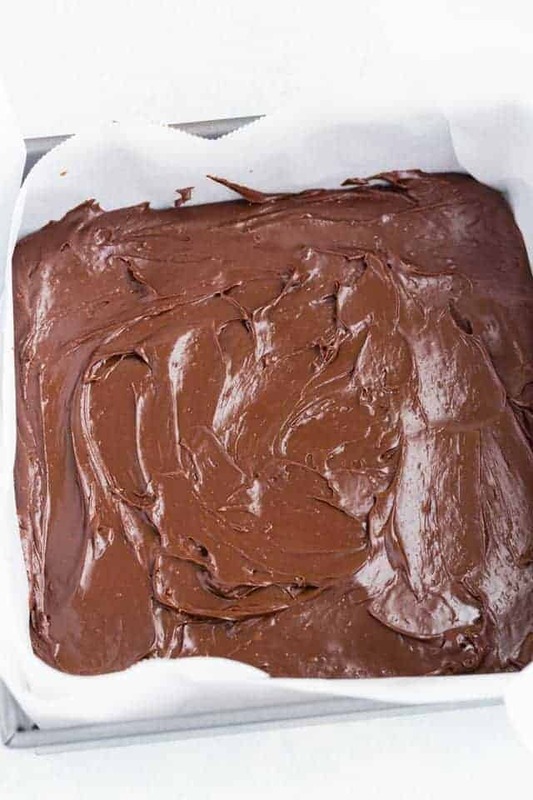 Spread the fudge mixture evenly into the bottom of an 8×8-inch pan lined with parchment paper. Refrigerate for 2 hours or until set. Lift the parchment paper and fudge out of the pan. Slice the fudge into 1-1/2 to 2 inch pieces. Place white chocolate in a heatproof bowl and set over a pot of barely simmering water. Stir continuously until chocolate is fully melted and smooth. Using a fork, dip each fudge piece into the melted wafers. Tap the fork on the side of the bowl and wipe any excess off on the rim. Place the fudge bite on parchment paper. Top with sprinkles if desired. Allow fudge bites to set for at least an hour before serving. I love that you coated the fudge and made it extra fun with the sprinkles! It looks delicious! 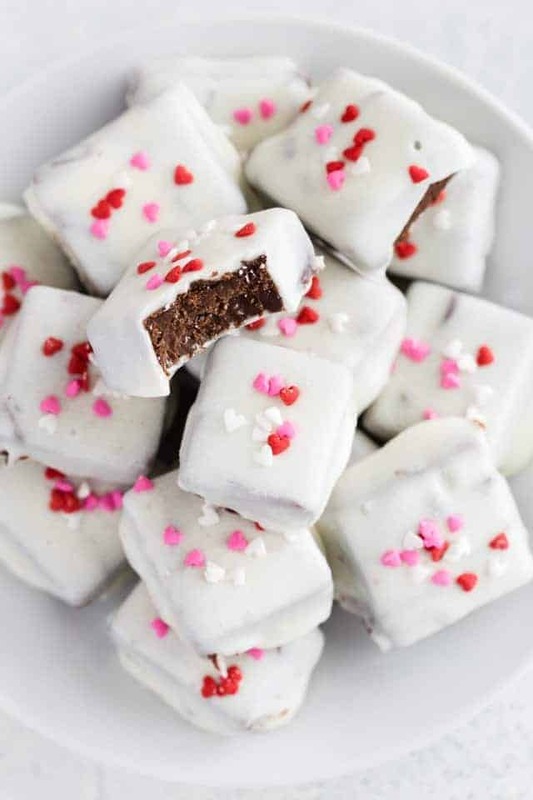 These fudge bites look amazing and perfect for Valentine’s day! Love these little bites! I love unique flavors of chocolate and the cayenne sounds perfect! Those are absolutely adorable! I love them! Wow! What a great idea. Never had spicy chocolate! You will enjoy it, Kathy. It’s not too spicy. Just enough to tingle the tongue. Those chocolates are so cute and oh-so-perfect for Valentine’s Day. I love that you added the cayenne pepper to the fudge. I bet it gives it a nice, little spice kick. oh these look so cute Jen! Love all the spices and Ghirardelli. is my absolute favorite! Yum! Beautiful and delicious. I think my valentine deserves one of these saucy bites! What a perfect little treat for Valentine’s day! Love that cayenne kick the hearts are adorable. We’re both repping Ghirardelli this week! My post goes up tomorrow 😉 PS- pinning! 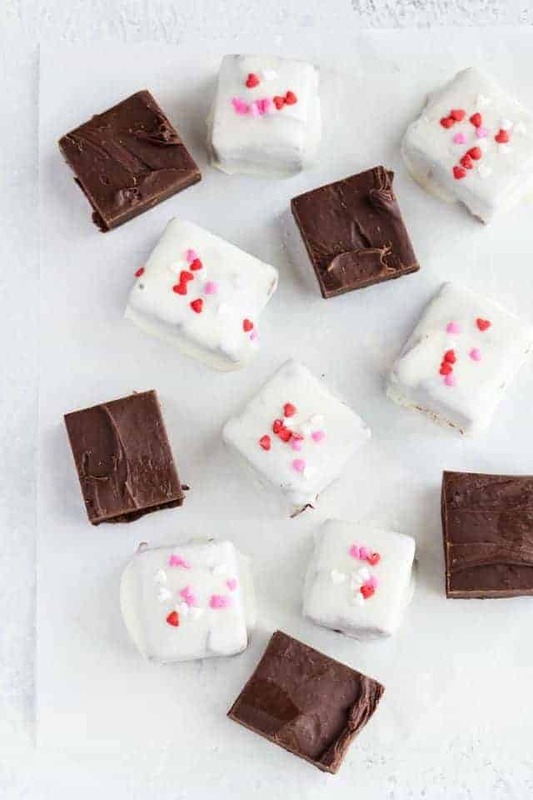 This fudge is pretty much what V-Day dreams are MADE OF! I am seriously swooning over all that chocolate-on-chocolate action going on! Oh, and Ghirardelli chocolate for the WIN! Yes! You can never have too much chocolate, right? Especially for V-day! Yes, Mexican hot chocolate fudge bites. That’s what I was aiming for. They are so addictive, you husband and kids will certainly love you for them! I love that these are spicy! My hubby and I are huge fans of sweet and spicy! Yummy and so beautiful! Pinned! There is just something so great about spicy chocolate. It’s a beautiful contrast. Thank you so much for the pin, Mariah! I’ve never been to one of their ice cream shops. I feel as though I’m missing out on something great! Thank you so much for the pin, Blair! Ghiradelli is my absolute favorite!! This fudge is fantastic. Isn’t it the best?! I am majorly addicted to their chocolate. These look amazing Jen! Love the addition of cayenne. You don’t see that too often in desserts.. Great idea! Thanks, Kelley! It’s a wonderful contrast of flavors. Oh these bites are just perfect and romantic!! You coated fudge in chocolate. OMG!!!!!!! Love that. Love the cayenne – that’s such a fun touch to the flavors! I love both chocolate and spicy foods and this fudge is incredible! You are doing awesome with candy making, could totally sell these! The Valentine’s Impressions are so cute! How sweet to combine both of your loves – chocolate and spicy. I bet these are delicious! I know, girl. Me too. There’s just not enough time to get it all done. Thanks for stopping by! This fudge looks perfect, Jen! I love how you dipped it in chocolate and added even more chocolate on top. This is a fudge lover’s dream! Pinned! These little fudge bites are so so pretty, Jen! I love all the spices you added in here, it sounds amazing especially with the Ghirardelli chocolate! Love the cute impressions, they’re perfect for Valentine’s Day! Aren’t those impressions the cutest! I popped them off the fudge bites just so I could eat them, haha. Ghirardelli chocolate really is the best. These are SO chocolatey!! The best. And I love that you spiced them up to kick up the awesomeness! They turned out so great! I couldn’t stop eating them. They literally melt in your mouth!